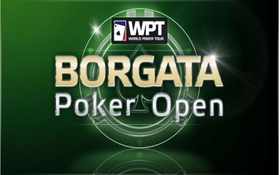 The story of the day on Day 1b of the WPT Borgata Poker Open was the huge turnout the tournament experienced as 853 total players entered the tournament, including 142 players who took advantage of the re-entry format after busting on Day 1a. The total turnout of 1,313 players absolutely shattered the previous record for the largest WPT tournament of 1,042 –set at last year’s Borgata Poker Open. Once again the end of the day chip counts had some very familiar names at the top of the leader-board, led by Day 1b chip-leader Jeff Madsen, who like Day 1a and overall chip-leader Abe Korotki, pocketed an extra $5k for ending his Day 1 flight as the chip-leader. In addition to Madsen, the Top 10 chip counts from Day 1b included the high profile names of Matt Affleck and David Williams, who both eclipsed the 150k mark, along with 2011 WSOP Ladies Champion Marsha Wolak and poker pro Mark Gregorich. By the end of the night the original field of 853 entrants had been substantially pared down to just 558 players. The survivors from Day 1b will now join the 245 players who managed to make it through Day 1a of the tournament, as Day 2 gets underway on Tuesday. With the record-setting number of entrants the total prize-pool swelled to over $4 million, with first-place nearly reaching the $1 million mark –falling just short at $922,441, with 100 places making the money, and six-figure paydays for all of the final table participants. This entry was posted on Tuesday, September 20th, 2011 at 11:52 am and is filed under Poker News. You can follow any responses to this entry through the RSS 2.0 feed. You can leave a response, or trackback from your own site.